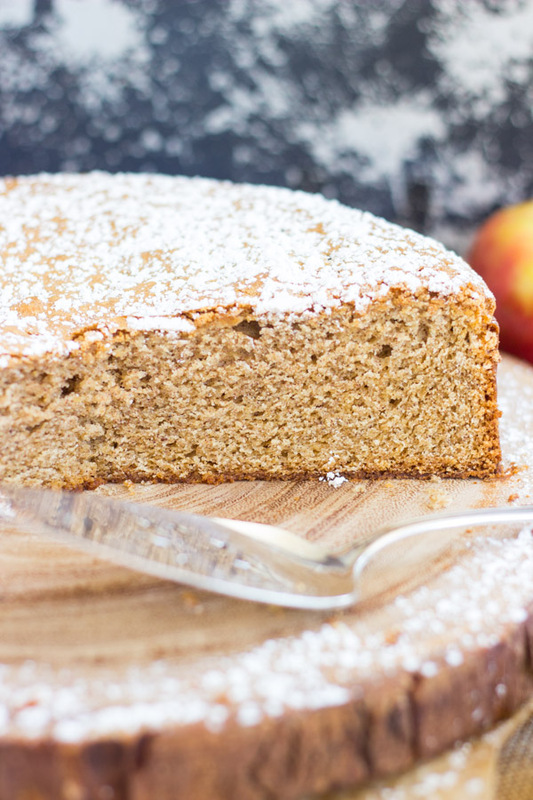 A rich and moist, but fluffy and springy apple pie-spiced olive oil cake. 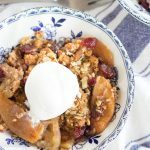 Topped with a dusting of powdered sugar, and caramelized apples! 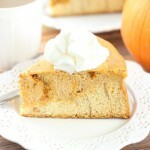 Olive oil cake with a fall makeover. I have a Citrus Almond Olive Oil Cake that was so incredibly popular at Christmastime about two years ago, and I wanted to resurrect it with a fall theme. That cake is like nothing else. It’s light and springy, fluffy, and a little spongey. Yet it’s dense and kinda chewy. It’s not an overly sweet cake, and it’s perfect for a person who likes a more rich dessert, versus something that’s straight-up sweet and sugary. I don’t discriminate against any desserts, but I know that not everyone likes stuff like fudge and marshmallows. Despite being rich, it’s not heavy. The olive oil makes it moist and rich, and adds a really interesting subtle flavor too, but it doesn’t make it heavy like a pound cake. 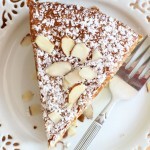 You beat the eggs pretty heavily so that it gives this cake a fluffiness and lightness. I wanted to add fresh grated apple to this cake, but I wasn’t sure if it would throw off the chemistry of this recipe, so I just threw in quite a lot of apple pie spice, and it honestly gives off all sorts of apple vibes with just that spice alone. I also rounded out the spices with cinnamon, ginger, and nutmeg, and so it’s pretty loaded up. There’s so much flavor to it with the blend of spices and the olive oil. I didn’t want to overpower those elements. However, if you want this to be more authentic with apple, then caramelized apples are where you want to take this dessert. I love a sliced fresh apple that’s been sauteed in butter and brown sugar. I never knew a fruit that didn’t benefit from a little caramelization. 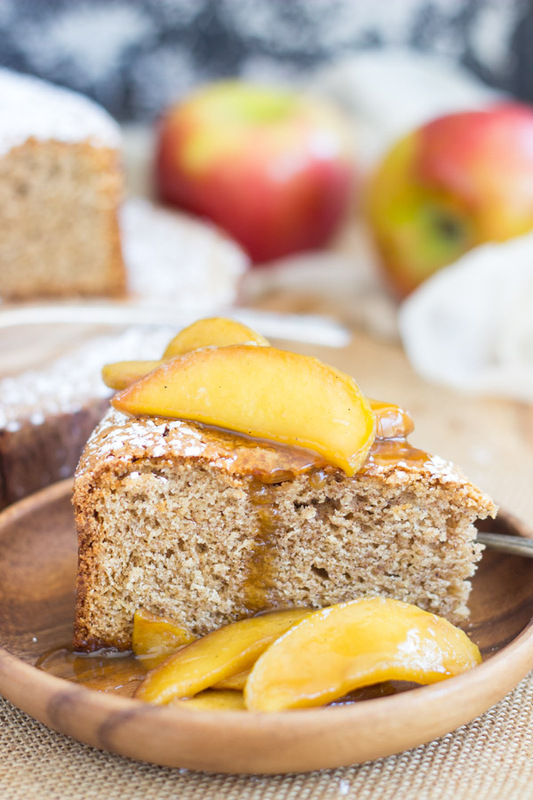 The warm, buttery, and sweet apples over a slice of apple-spiced olive oil cake is a dessert you don’t want to miss this fall. 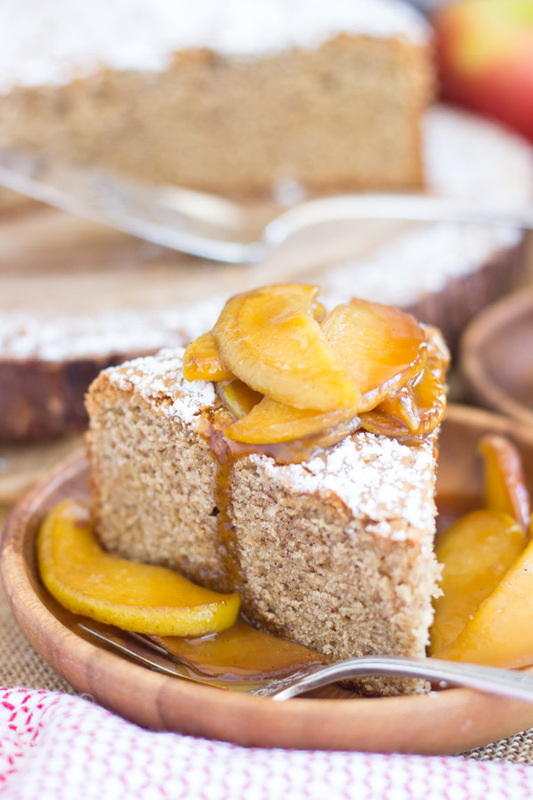 A rich and moist, but fluffy and springy apple pie-spiced olive oil cake. 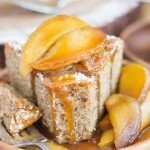 Topped with caramelized apples! 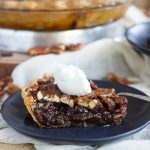 In a medium bowl, whisk together the flour, baking powder, baking soda, salt, apple pie spice, cinnamon, ginger, and nutmeg. In a large mixing bowl fitted with the whisk attachment, beat the eggs and granulated sugar at high speed until pale and fluffy, about 5 minutes. Add the buttermilk and vanilla, then the remaining flour mixture, until just blended. Bake at 325 for 40-45 minutes, or until the top is golden and a toothpick inserted near the center comes out clean. 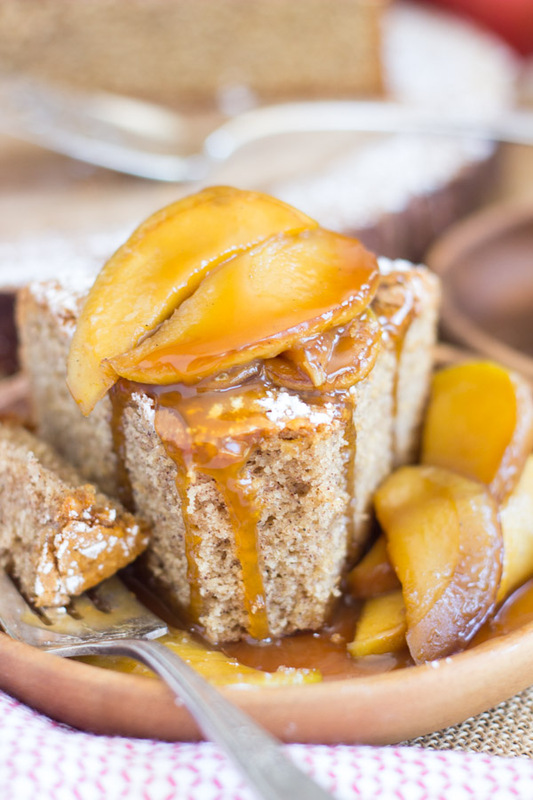 Dust with powdered sugar, and top with caramelized apples. Once melted, add the apples. Cook for 3-4 minutes, or until they are lightly browned, and starting to soften. Add the brown sugar and water, stirring to mix. Continue cooking apples an additional 3-4 minutes, or until they are golden and soft. Serve warm over slices of cake. Good Afternoon Sarah, I saw your apple spiced olive oil cake over at Snickerdoodle and I had to visit you. 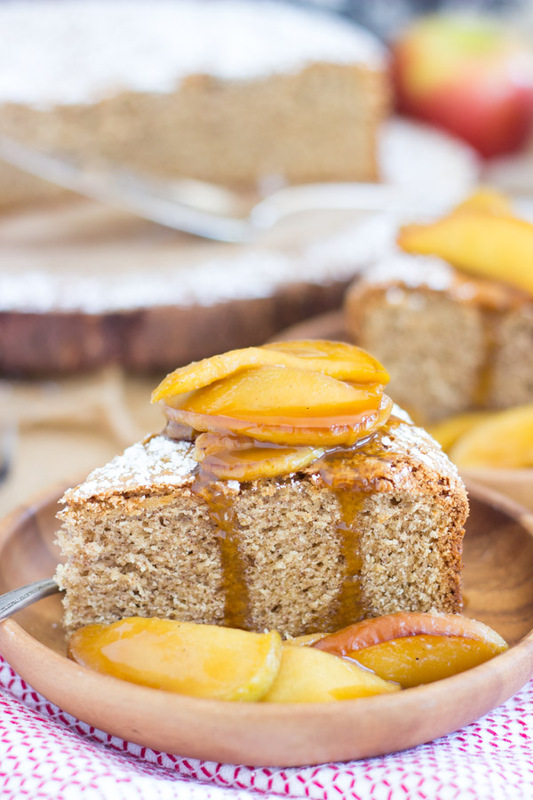 I use olive oil in most of my cooking and I have made cakes with olive oil, but I love the sound of your apple spiced olive oil cake and I cannot wait to try it. I am so intrigued by this recipe. The cake looks so dense and sounds quite delicious! Pinned and sharing. Thanks for linking up at Family Joy Blog Link-up Party this week! how delicious! 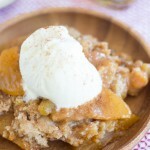 looking forward to trying this recipe with our freshly picked apples. Its been a long time since Ive made a olive oil cake. Inspiring and I like the makeover. Thanks for sharing with us at Throwback Thursday. Pinned and Shared! oh man – Sarah! This looks amazing! Thanks for sharing on the What’s for Dinner link up! You’ll love it! Olive oil cake is so unique! Looks amazing! Thank you for linking up with us at #HomeMattersParty .See you again next week. Yum! 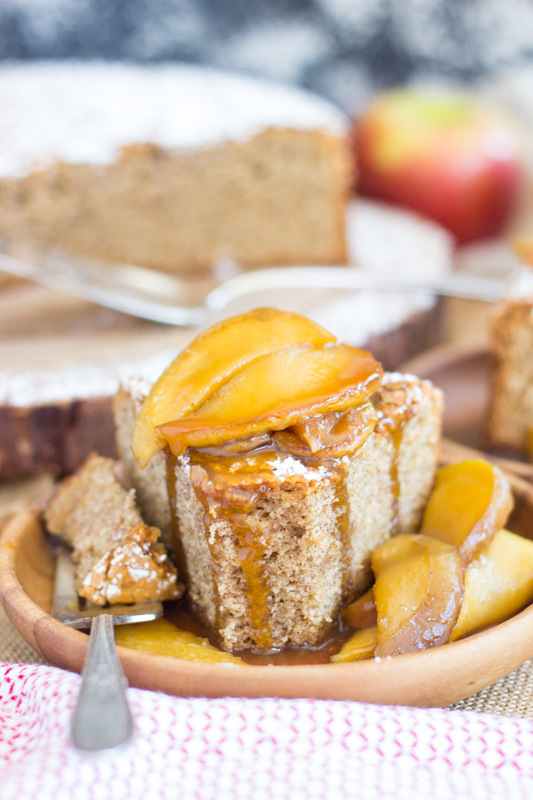 This is a beautiful cake and those apples are setting off cravings! Thanks for sharing with us at Throwback Thursday! Hi Sarah, Your cake looks so good. 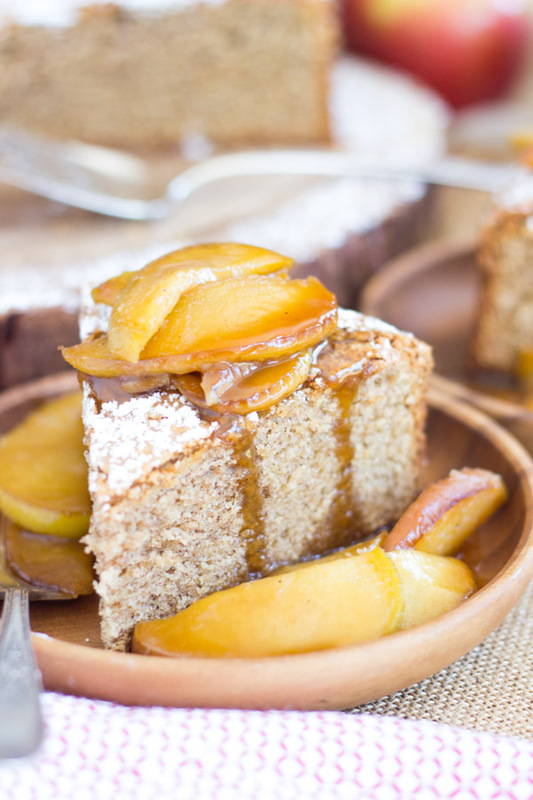 I just made an apple sheet cake but, I might have to try this next. Thanks for joining us at the Inspiration Spotlight party. Shared. I have never tried that with Olive Oil Cake! I’m honestly not sure. I’d love to know though, so I may actually try that. I would think that it would work if you adjust the baking time to 12-15 minutes or so, but I’ve never tried it!